After 7 seasons, Game of Thrones fans have spent countless hours pining over dialogue and plot points embedded in each episode, trying to predict what’s to come in the eighth and final season of the HBO series. While the network and cast have stayed mum on giving away any spoilers from the final season, that has not stopped fans from piecing together theories on how the beloved show will end. Since it has been more than two years since Season 7 of GOT, many can say (at least we can) that they have scoured the internet searching for fan theories to prepare ourselves for what’s to come in the final six episodes. One theory that has flown under the radar is one involving the mythical character known as the "Great Other." But since it was mentioned in both the books and TV show, some fans feel the idea of the Great Other will play a major role in the upcoming final season. So, what is the “Great Other” theory in Game of Thrones? The Lord of Light — also known as R’hllor — has been a key figure mentioned throughout the show. The god is at the helm of Melisandre’s storyline; however, the antithesis of the Lord of Light is the Great Other. First mentioned in Season 4 of the series, Melisandre explains to Shireen Baratheon that this other god represents the opposite of R’hllor: Darkness, evil, and fear. The Great Other is “eternally at war” with the Lord of Light. Though the two gods have not manifested in physical form (that we know of) in the show, some fans believe R’hllor’s champion, Azor Ahai (predicted to be Jon Snow), is the key to stopping the Night King and his army. While we patiently wait to see which character may take on the role of a reborn again Azor, some fans have have theorized that the Great Other will take on a physical form in that of the Night King. 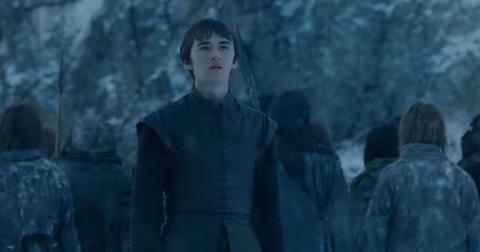 Reddit user CappitXL shared a full explanation on Bran’s power of being able to see the past, present, and future, as well as alter things in the past that affect the future/present (Namely, the “Hold the Door” episode in which we learn Hodor’s fate). The fan then explains how that if the Night King is the Great Other, Bran would be R’hllor. "How are Gods among man? The answer is: they aren't. Gods, as in the religion, are tales, told time and time again from person to person. Real people become legends, and magical events become God like." They continued to explain the idea of gods and magic in relation to the world of GOT, concluding that these men became "gods" in the eyes of others after stories were passed down generation after generation. Therefore, this fan predicts that Bran will step into the role of the Lord of Light and the Night King is the Great Other. As we know the Great War is coming, we wonder if this theory will unfold in the final season. Watch the final season of Game of Thrones when it premieres on Sunday, April 14, at 9 pm. ET on HBO.